First I created an honest-to-goodness home page. If you come to my blog through direct links, you might not ever see it, but it’s there and I really like the way it looks. While the template I’m using doesn’t create it automatically (I know others do and I haven’t figured everything out for this editor yet), now I have the post teaser icons on the front page. Plus it displays my Instagram pictures in a way that makes me look a little bit cooler than I really am. I’ve aired things out, added a little more information to the contact page and well, a bunch of little details (colors, fonts, menu) that you might not even notice. But I’m pretty happy with it. It wasn’t a perfect conversion, though. The snazzy design isn’t translating to mobile devices (though it’s fine on tablets). I’m still trying to figure out what’s going on there. There are still little things here and there that I have to figure out. Also, in the process of updating my portfolio site, my WordPress back-end got all weird and combined the two as far as stats, followers and subscribers. In the process of trying to divorce the two, I lost all of my subscribers to this site (I don’t need subscribers to the portfolio site as it’s not a blog but that’s where they all stayed). It was a bummer to lose the stats, but I’m really bummed that I lost my subscribers. If you’re willing, please consider subscribing/re-subscribing to my blog (you’ll get an email when I make a new post) or following if you’re a WordPress user. 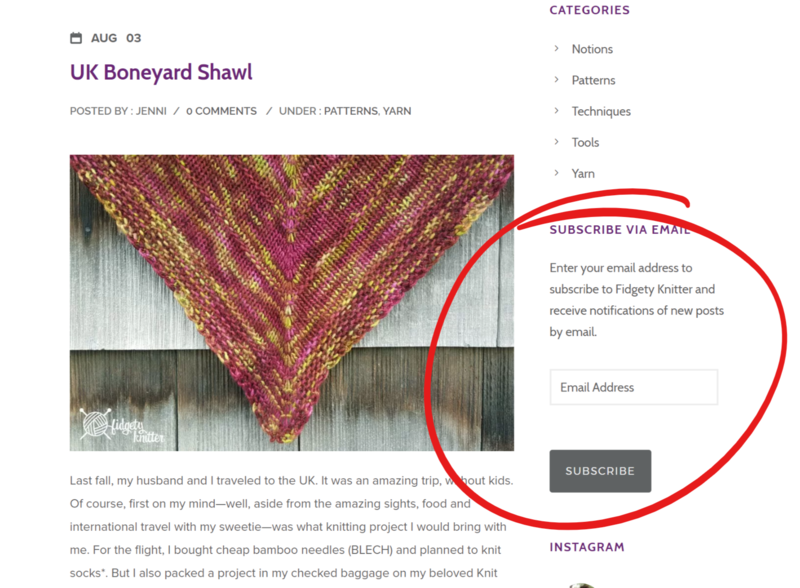 If you look to the sidebar off to the right, you’ll see a box for subscribing (see below). Just enter your email and WordPress will do the rest. I promise that I will not spam you (you will get a confirmation email but the rest should be posts). You can also follow along in your reader with my RSS feed. I want to say thank you for following along on my knitting adventures. I have been negligent of my blogging duties this summer, but have several projects ready to write about going forward. I just started watching Luke Cage and have more TV and knitting pairings to share with you as well. And I really hope you’ll continue to comment. In the meantime, is there anything special you’d like to see on the blog? Let me know in the comments!